Today's So Shoe Me is the Edna Satin Pumps by Theyskens' Theory, $425, available at Shopbop. A brightly hued tie dye print on sophisticated satin adds a downtown finish to an uptown style. Mimicking stained glass this colorful pointed to pump adds a signature touch to neutral favorites this fall. 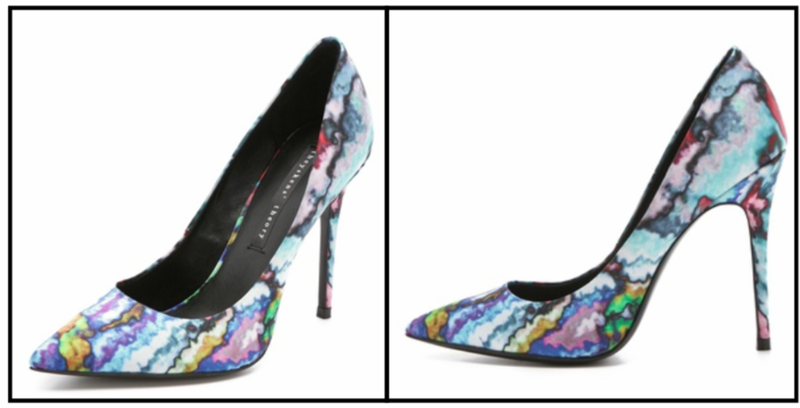 The classic pointed toe shape and modern tie dye print make for the perfect combo of timeless and new for the perfect pump to splurge on this season. And these pumps aren't just a pretty print, you can wear them with work separates, party dresses or your favorite pair of jeans. For a night out style these pumps with a cutout black jumpsuit and bright accessories. So Shoe Me a pair of stained glass stilettos with a classic pointed toe and modern satin upper for a fashion forward pump that will add the perfect pop of print this season and beyond.